Ridiculing Modi for his assertions of being the country’s “chowkidar” (watchman), Gandhi said the entire country knows the “chowkidar has turned into a thief”. 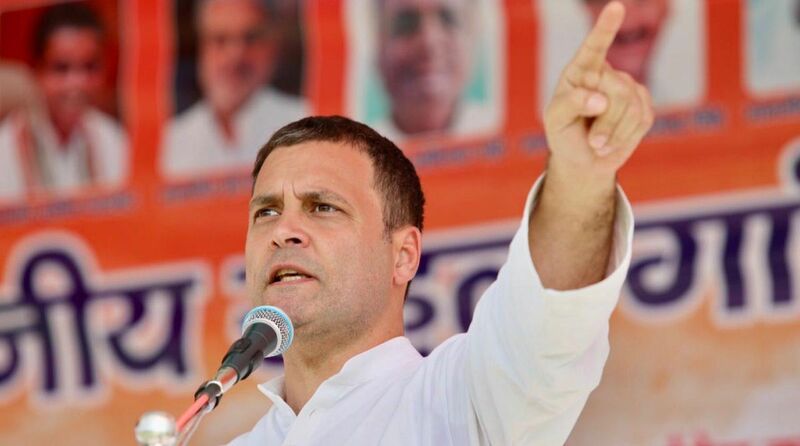 Congress President Rahul Gandhi on Saturday dared Prime Minister Narendra Modi to break his silence on the Rafale “scam” and assured poll-bound Chhattisgarh of completely waiving off farm loans if his party comes to power in the state. Addressing rallies in the state, Gandhi tore into Modi and the Raman Singh-led Bharatiya Janata Party (BJP) regime in the state over a host of issues, particularly corruption and crony capitalism. “Modi keeps on making speeches and addresses electing rallies but doesn’t even utter a word on Rafale. The entire country knows that you did the deal to enrich your industrialist crony. The entire nation is now saying ‘chowkidar chor hai’ (watchman is a thief). “At least now say something about Rafale, tell the people how you stole money from Indian Air Force (IAF) and gave it to your friend,” said Gandhi addressing a rally in Darima in Surguja district. He charged the ruling BJP with creating two Chhattisgarhs, one of the rich and the other of poor and exploited. He assured that farmers’ loans would be completely waived off within 10 days of his party coming to power in the state. “Chhattisgarh was created so that it natural resources can be utilised for the welfare of the people but now we have two Chhattisgarhs — one of the rich, of those wearing suit-boot, and the second of the masses — poor, marginalised, farmers and workers. “We don’t want two Chhattisgarhs, we want justice,” said Gandhi, addressing a rally in the erstwhile princely state of Korea. Claiming that Rs 3.5 lakh crore of corporate loans were waived off by the Centre, Gandhi demanded reply from Modi as to why not even a rupee of farm loans was waived off. “I had asked Modi why he was not writing off loans given to the poor farmers, but he never bothered to reply. So from here I declare that within 10 days of coming to power in the state, we will waive off loans of each and every farmer,” said Gandhi. He said the waiver of farm loans will be offset by recoveries from fraudsters like Vijay Mallya, Nirav Modi and Mehul Choksi who, with the help of Modi government, defrauded banks of billions of rupees. Gandhi attacked Chief Minister Raman Singh over a Rs 5,000-crore chit-fund scam and a Rs 36,000-crore scam in the public distribution system (PDS). The Congress leader also alleged that Chief Minister’s son Abhishek has undisclosed offshore accounts as per revelations in the Panama Papers. Addressing another rally in Jashpur, Gandhi alleged the “Rafale deal was done by Modi to give Rs 30,000 crore to his industrialist crony”. He also promised setting up food processing units in all the blocks in the state so that farmers could easily sell their produce and get the right price, and their sons and daughters jobs in these factories. He also flayed the Singh regime for unemployment, saying despite thousands of vacancies in various government departments and institutions, youth were not employed due to corruption. Gandhi said the difference between the Congress and Modi was that his party always strove to fulfill its promises. “Unlike Modi, who makes tall promises only never to fulfil them, we make promises knowing we will fulfil them,” he said exuding confidence that his party would come to power in the state. The second phase of Chhattisgarh Assembly polls in 72 constituencies spread across 19 districts will held on November 20. The first phase of polling in 18 constituencies across eight Maoist-affected districts was held on November 12. The results will be declared on December 11.